Central to the Uncertified Pilot is my aspiration to obtain a virtual Instrument Rating: To master most of the flight knowledge and skills that are required to pass an actual, real-world IFR checkride. In order to become Instrument Rated, however, I need to obtain my virtual Private Pilot license first. As I have no certified flight instructor to guide and assess me, my training will be mostly self-regulatory and self-correcting. How would I structure my flight simulator training? Luckily, however, PilotEdge exists: A subscription-based, online multiplayer network that brings realistic ATC to your flight simulator. Don’t know about PilotEdge yet? Visit those guys right away. 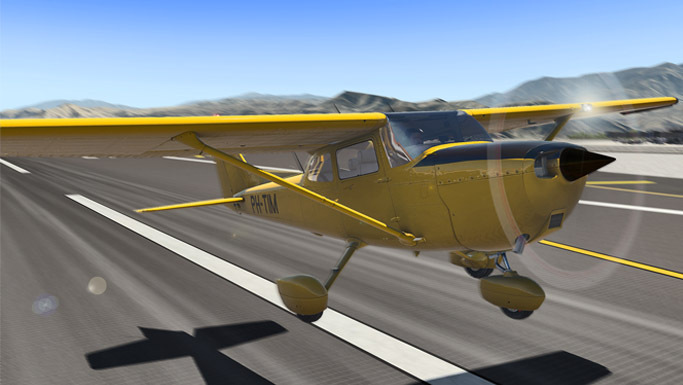 PilotEdge also offers realistic VFR and IFR checkrides to pass for, assessed in-game by their professional ATC controllers. These checkrides, called CAT ratings, require you to use real-world ATC protocol and follow all airspace regulations, while executing basic to complex VFR/IFR departures, airspace transitions, and arrivals. Based on PilotEdge’s checkrides, I have developed my own PPL and IR training programs that structure my lesson goals. Have a look at the training stages below. Once I pass for all of PilotEdge’s checkrides, I’ve pretty much earned a virtual Instrument Rating. That’s how I will determine my ability. Using my Twitch.tv channel, I live stream my every flight to your home. These streamed flights will also be recorded and archived on my YouTube channel for later review and used to keep record of all of my mess-ups, struggles and learnings as I attempt to pass PilotEdge’s VFR checkrides. This way, my Twitch and YouTube channels will gradually evolve into a useful resource that you can benefit from too. Below, or through the main menu, you can access all of my PPL training stages and recorded flight training. There you can track my progress and learn about the things that I found useful to better understand flying. Please feel free to critique my training or notes by leaving your comments. I would love to learn as much I can about flight training. Don’t hesitate to teach me something interesting and new! Hop over to Stage 2: Uncontrolled airspace to start watching right away! I visited your site by chance, I was looking for some addons for Prepare3D and then I landed here. I was reading your blog and I decided to write you because I felt very identified with you. A few years ago I thought of trying Flight Simulator as an escape to satisfy my desire to fly, but the lack of graphics realism of the simulator and the difficulty of obtaining good educational material to learn to fly made me give up (maybe the main reason is that playing flight simulator remembered me what I could not be). Actually, I’m trying to learn to pilot a virtual plane with many forces, realism in the simulator has improved tremendously with several addons and I assumed I’ll never be a airliner pilot :). But honestly, I’m real lost with learning to fly, I do not know how to start, I’m reading Cessna 172 manual, aircraft instruments tutorials and anything that can help me. It would be nice if you could give me any advice. I’m sorry I didn’t want to overextend! Reading your story was like reading mine and I needed to tell you that I appreciate so much you be doing the effort to share your experiences with the rest of people, for sure will help someone, me too! Hi Carlos, thank you for your kind words and welcome to the Uncertified Pilot! If you’re interested in flight training, I would recommend you reconsider taking on flight simulator again. Combined with the right third-party add-on software, you can get really really close to the real thing. Have a look at the ‘My Prepar3D’ page to get an overview of my own flight simulator configuration (accessible through the main menu on top of the page). Happy flying! Greetings from Argentina. I just came across your website, searching for some information. I recently installed my FSX-SE again, and wanted to take my flight sim a bit more seriously. Your course is impressive, and I’m looking foward for more updates of your progress, also new material to keep learning myself. I will try to learn all your listed lessons to get my “personal PPL”. Please keep them update! Please forgive my poor English, i didn’t wanted to leave your web without telling you how useful it is. Hi Julián. Thank you for your kind acknowledgments. My personal PPL/IR programs will evolve and expand with time through the training resources I come across while training. Be sure to follow me on Twitter/Facebook to keep updated! Happy flights! Just a question.. Is there something i can use to follow your flights and progress on PilotEdge?